On-site enrichment programs can add dimension to your traditional group setting; or even add these ideas to your special events and school fundraisers. Stuck with little budget and no transportation? Many museum exhibits are thinking out of the box and traveling out to you! Here are ideas for traveling exhibitions, interactive presentations, and experts that can bring the experience to you! No extra paperwork for board approvals, no transportation hassles, or extraordinary budget requirements. On-site enrichment programs can add dimension to your traditional group setting; or even add these ideas to your special events and school fundraisers. 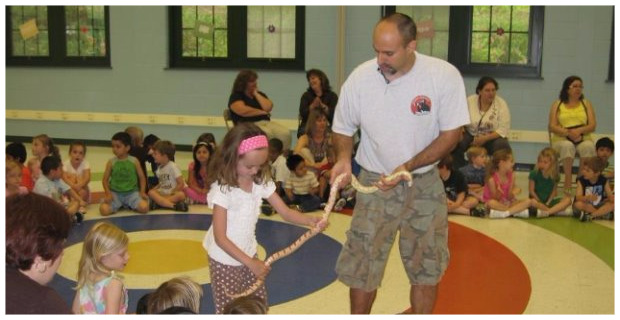 Rizzo’s Wildlife World educators bring hands on experience with reptiles and wildlife. We have the experience that allows us to formulate school and camp programs that not only support your curriculum but also teach in a way that keeps your students attentive, laughing and learning. Our hands on programs come to life before their eyes with live animal interaction, tactile exhibits and a super cool sound system. All ages. 973-586-0444. Engage your student body in a healthy lifestyle assembly. For Ages 5-12. “Try it, you’ll like,” is a one-of-a-kind, hands on healthy-lifestyle experience that empowers children to try healthy foods, be active, participate in family meals and much more. Fun and interactive tasting experience that leaves principals, teachers, parent volunteers in awe as kids tempt their taste buds. 201-891-2066. Outreach educational programs for schools, scouts and camps. Traditional Earth Skills offers a variety of programming including Lenape education. Our assembly program includes many museum quality artifacts and hands on wilderness skills where students get to try the same daily tasks as Lenape children. We also provide an opportunity for students to make a “take Home” artifact for themselves. All ages. 973-570-2882. A planetarium experience. Using the Starlab Portable Planetarium System, Stars To Go brings the universe to you. Students view the nighttime sky on the particular day of the visit. They will observe the stars, planets, the moon and other celestial objects as they appear in the evening sky. We make it possible for all students to become amateur astronomers. PreK-8th grade. 908-347-5185. Large scale exhibits, interactive shows, digs & gemstone mining to your school! Dinosaurs Rock can transform your gym into a museum with over 30 amazing specimens that students can touch. Spectacular interactive presentation. 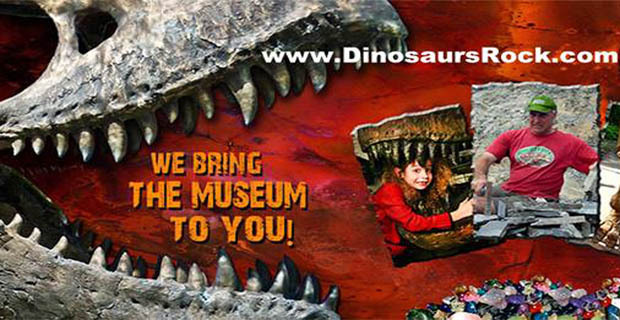 Choose from 3 programs: Dinosaurs Rock, Gems Rock, and Oceans Rock. 800-411-3466. Jack Ryan is the Hoop Wizard, a 3x Guinness Record Holder. 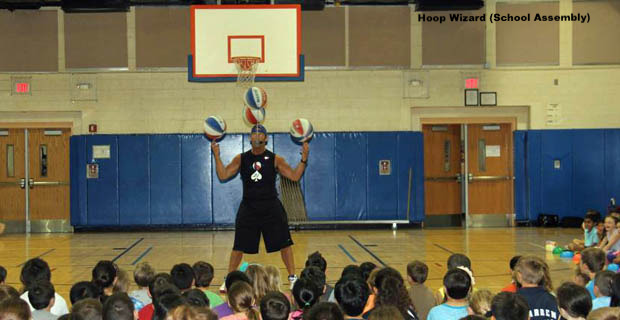 Whether your students and faculty are in need of some motivation or just some good old-fashioned entertainment, the Hoop Wizard can entertain students, faculty, and administrators with a specialized 45-minute interactive comedy basketball show. 917-754-2486. The Monmouth Museum is offering the world in a steamer trunk–perfect to bring learning alive in any classroom, camp, or birthday event! Explore Science, Art & History. Topics include: Colonial American Living, The Rain Forest, Under the Sea, The Amazing Human Body, Habitats, and more. 732-224-1992. Preschool of Rock offers exciting, entertaining, and educational music shows for kids. Preschool of Rock travels with a selection of diverse instruments. During our performance we explain the anatomy of the instruments, their origins, and how they work! leighann@wearthecapekids.com A 45 minute long elementary program that shows how students can embody heroic character, as well as tactics they can use to stand up against bullying effectively. We provide a sequence of relatable videos, in combination with in-person facilitators. Kids make connections, practice skills, and learn strategies needed to be a positive force in their communities and be BETTER THAN THAT™ . If you can’t come to the Refuge, we’ll bring the animals to you! We offer two presentation formats; Auditorium-style and Classroom-style. Some topics include: Hunters of the Sky, Raptors and Reptiles, Predator and Prey, Endangered Species, Winged Wonders, Snakes, Frogs and Turtles and more. Bring us to your next science expo with live animal presentations, interactive lessons or experiments with animal adaptations. Bring awesome science to your school! After-school clubs, in-school field trips, interactive school assemblies, fun family science nights. 877-870-9517.